1985-07-12. New. Ships with Tracking Number! INTERNATIONAL WORLDWIDE Shipping available. Buy with confidence, excellent customer service! Vintage, 1985-07-12. Enlarged. Paperback. Used:Good. 1984-07-05. New. Ships with Tracking Number! INTERNATIONAL WORLDWIDE Shipping available. Buy with confidence, excellent customer service! 1984-07-05. Good. Ships with Tracking Number! INTERNATIONAL WORLDWIDE Shipping available. May not contain Access Codes or Supplements. May be ex-library. Shipping & Handling by region. Buy with confidence, excellent customer service! 1992-07-05. New. Ships with Tracking Number! INTERNATIONAL WORLDWIDE Shipping available. Buy with confidence, excellent customer service! William Morrow & Co. Hardcover. 0688039014 Item in very good condition! Textbooks may not include supplemental items i.e. CDs, access codes etc... . Very Good. Place_Pub: New York: The Macmillan Company, 1966. Fourth Printing. fair to good, fair. 300, illus., endpaper illus., index, edges somewhat soiled & spotted, small stains on title page, DJ worn & soiled. Several edge tears, small edge chips. Oral history from 22 baseball players in the first half of the 20th century. William Morrow & Co, 1984-08. Hardcover. Good. Harper Perennial Modern Classics. PAPERBACK. 0061994715 New Condition. . New. HarpPeren. PAPERBACK. 0688112730 New Condition. . New. The Macmillan Company. Used - Acceptable. Acceptable condition. Book Acceptable. No dust jacket. Owner's name on endpage. HarpPeren. PAPERBACK. 0688112730 Has moderate shelf and/or corner wear. Great used condition. A portion of your purchase of this book will be donated to non-profit organizations. Over 1,000,000 satisfied customers since 1997! We ship daily M-F. Choose expedited shipping (if available) for much faster delivery. Delivery confirmation on all US orders. . Very Good. March 1992. New York, Macmillan, 1966, hardcover, xviii-300 pp, First Edition, First Printing stated, Very Good in Very Good dustjacket. Straight and firmly bound, small stain to top of front hinge. Dustjacket unclipped bearing original price, light edge nicks, closed edge tears noticeable near head of spine, in new Brodart sleeve. 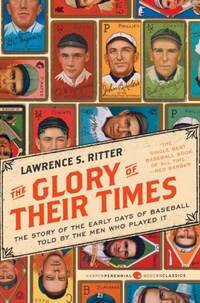 The early history of baseball compiled from personal interviews with some of its original stars, frequently cited as 'the best book about baseball ever written'. Profusely illustrated throughout with reproductions of black-&-white period photographs, illustrated endpapers. Index appended. Foreword by John K. Hutchens. 1992-07-05. Good. Ships with Tracking Number! INTERNATIONAL WORLDWIDE Shipping available. May not contain Access Codes or Supplements. May be ex-library. Shipping & Handling by region. Buy with confidence, excellent customer service! Harper Perennial Modern Classics. PAPERBACK. 0061994715 Like New Condition. . Fine. HarpPeren. PAPERBACK. 0688112730 Like New Condition. . Fine. New York, Macmillan, 1966, hardcover, xviii-300 pp, First Edition, First Printing stated, Very Good in Very Good dustjacket. Straight tight and clean, small ink marks to front endpaper like someone was testing a pen (idiot). Dustjacket unclipped bearing original price, light edge nicks, short closed edge tears, faint stain to bottom of rear panel, in new Brodart sleeve. The early history of baseball compiled from personal interviews with some of its original stars, frequently cited as 'the best book about baseball ever written'. Profusely illustrated throughout with reproductions of black-&-white period photographs, illustrated endpapers. Index appended. Foreword by John K. Hutchens. Harper Perennial, 1992-03-19. Paperback. Used:Good. Holtzman Press, Inc. Used - Good. Shows some signs of wear, and may have some markings on the inside. Harper Perennial Modern Classics. REP ENL. Sports & Recreation. New. Harper Perennial Modern Classics Brand New: This item is brand new unopened, never used and still in its original manufacturer condition. Harper Perennial Modern Classics. PAPERBACK. 0061994715 Special order direct from the distributor . New. HarpPeren. PAPERBACK. 0688112730 . New. Harper Perennial Modern Classics, 2010-04-06. Paperback. Good. U.S.A.: Collier Macmillan Ltd, 1971 SOFT COVER IN VERY GOOD CONDITION. Soft cover. Very Good. N. Y.: Vintage Books, 1985. Softcover in very good tight condition. Back cover has been bent in along front edge. has a crease now. Sitll A Nice Copy !!. Soft Cover. Very Good/No Jacket. Harper Perennial Modern Classics, 2010-04-06. Rep Enl. Paperback. Used:Good. Harper Perennial Modern Classics. PAPERBACK. 0061994715 Remainder mark . Fine. Harper Perennial Modern Classics. PAPERBACK. 0061994715 . New. U.S.A.: Quill Books / William Morrow, 1992. Book. Near Fine. Soft cover. 8vo - over 7¾ - 9¾" tall. Near-fine condition. No remainder marks or clippings. Covers are clean, show light wear - no tears. Tight spine, clean pages. 360 pages. Illustrated throughout. No writing or tears inside book. Previous owner's name ;abel in book front on blank page (Justin A. Blandford). Harper Perennial Modern Classics. PAPERBACK. 0061994715 *BRAND NEW* Ships Same Day or Next! . New. Harper Perennial Modern Classics. PAPERBACK. 0061994715 *LIKE NEW* Ships Same Day or Next! . Fine. Harper Perennial, 1992-03-19. Paperback. Good. Harper Perennial Modern Classics. PAPERBACK. 0061994715 BRAND NEW, GIFT QUALITY! NOT OVERSTOCKS OR MARKED UP REMAINDERS! DIRECT FROM THE PUBLISHER!|0.93 . New. Harper Perennial Modern Classics. Paperback. 0061994715 . New. 2010-04-06. Reprint, Enlarged. Harper Perennial Modern Classics. PAPERBACK. 0061994715 Minor shelf wear . Very Good. Collier Macmillan Ltd, 1971. Paperback. Acceptable. Disclaimer:A readable copy. All pages are intact, and the cover is intact. Pages can include considerable notes-in pen or highlighter-but the notes cannot obscure the text. Macmillan. Used - Good. Shows some signs of wear, and may have some markings on the inside. Macmillan. Used - Acceptable. Shows definite wear, and perhaps considerable marking on inside.